I was asking Mike Thorp (creator of Twilight) for some more information on Delgon Buildings as I thought I might tackle one of their towers as my next kit. He graciously sent me these three sketches. The basic squat regular towers. That 'inverted buttress' on the overhanging tower is supremely impractical but awesome! Although both styles are base don cylinders, there seem to be more rules about Delgon architecture than empire ones. They tend to be squatter, and differing diameters of tower are arranged concentrically. Where the Empire buidings grow haphazardly with each family group adding extensions, turrets, and such like using whatever materials are to hand, the Delgon buildings are much more massive and are communal, planned structures. Tucked away in the freezing Setir Mountains protection from the elements is more important than for the Empire, and so the structures are enclosed. Wood is scarcer in the mountains but building stone is plentiful. I think these designs lend themselves better to modular components than the haphazard nature of furbarnii empire buildings, so I spent some time CAD modeling and came up with 9 basic structures. Because of the modularity its also easy to invert one of the roof sections to do this. The same Tower with a bulging storey. And with a bridge added and a little imagination its easy to do something like this. The triple towers of Paygarl! To give you an idea of scale, the largest of those cylinders is 8" (200mm) in diameter and each storey of the models is just over 2" (55mm) in height. 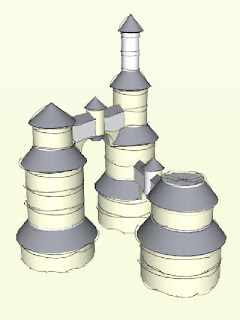 I'm going to use cardboard postal tubes for the main cylinders and laser cut styrene to form the roofs and shingles in the same way as i did on the Pryn-Gul Tower. As always commenst suggestions and advice greatly appreciated.